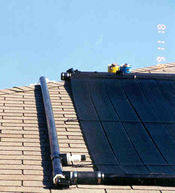 This page shows the various valves that are installed as part of the solar pool heating system installation. 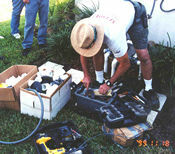 In most cases, an installation crew consists of several persons. This enables each installer to concentrate on one area, as in this case, the installation of the pool pump area piping, valves, controller, and sensors. This well equipped installer has all the tools and materials required to complete the job. 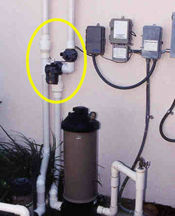 This photograph shows a number of important system valves (within the yellow circled area) that system owners should be familiar with. They are installed in the collector loop feed and return lines. It is important that the system owner understand the function of each of these valves. A close-up of these valves is provided in the next frame. This photograph shows the three major valves used in the system. The check valve allows water to flow in only one direction, while the isolation valve is used to isolate the collector loop. 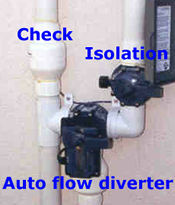 The auto flow diverter valve is used by the controller to divert flow to the collectors and back. This valve operates in conjunction with the system controller. When there is heat to be gained at the collectors, the valve diverts water to them. The installers have also incorporated a vacuum breaker and freeze prevention valve in the collector loop. These are located in the feed line going to the first collector of this multiple collector array. The next frame provides an explanation of the function of these two valves. The vacuum breaker allows for proper drainage of the collector loop, while the freeze valve provides freeze protection in the event some water is still in the piping or collectors.